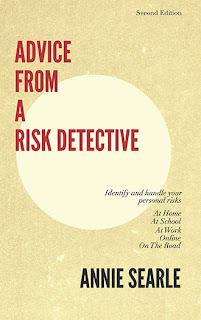 Advice From A Risk Detective: Where are we now? How do we move forward? Where are we now? How do we move forward? One of two cornerstones of the National Academy of Arts and Science. This weekend marks the tenth anniversary of Hurricane Katrina, an event so significant that the practice of emergency management by the federal government was changed forever. Today marks the 54th anniversary of the March on Washington where Martin Luther King, Jr. gave his famous "I have a dream" speech. It is the 60th anniversary of the vicious murder of a Chicago boy, Emmett Till, when he visited relatives in the South and whistled at a white woman. Two days ago, a TV reporter and cameraman were shot dead in the head on a morning news program by a killer who then posted video of the murders to social media. In a 23 page suicide note, the only thing that the murderer left out of his message was the similarity to ISIS acts of terror that also take place in living color and then get posted to social media sites. While the federal government has completely reshaped its responses to disasters, we can't really pat ourselves on the back where equality and justice that Reverend King was looking for is concerned. The situation has never been worse in this country where distrust and anger are concerned, and the gap continues to increase between those who have and those who do not. The situation appears intolerable also where gun control and mental health proposals go unfunded and unapproved. The National Rifle Association (NRA) continues to have a lock hold on our elected officials where even the simplest forms of information sharing are concerned -- registering guns and sales of guns in such a way that federal and state police databases are interlocked to detect those with criminal or mental health histories. Why is this passing bare bones legislation that could trap for lowest hanging fruit so difficult? What do we need to do to be heard? The interior cornerstone at the National Academy of Arts and Science. The worst of it in all this is that each episode seems to set off more disturbed people in what are called copycat events. Just as those who ride trains every day are probably now more aware of their environments after the events of last weekend on the Amsterdam-Paris train, I suspect that every news person will feel their own heightened anxiety for at least the next several months. Given the flammable nature of public discourse on so many issues these days, especially with presidential politics starting make things worse, I would suggest that we need to find new ways to move the discussion on gun violence forward, to see if it is possible to affect real change on this issue and on the issues involving equality and justice as well.